Charlotte Rhead was born in Burslem, Stoke-on-Trent on 19 October 1885 and became one of the leading English ceramics designers of the 1920s and the 1930s in the Potteries area of Staffordshire. Charlotte Rhead pottery, Charlotte Rhead ceramics and Charlotte Rhead designs have become very collectable. 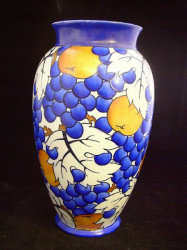 Pictured: Charlotte Rhead Pottery Vase – A Charlotte Rhead ‘New Vine’ vase By Burgess & Leigh, circa 1929, of ovoid shape with flared rim, tube-tooled and painted with blue grapes and orange lustered fruits amid foliage, 29.7cm, printed mark, tube-lined signature. Sold for £353 at Bonhams, London, August 2005. Charlotte Rhead was born into an artistic family. Her father Frederick Alfred Rhead began his career at Mintons as a pate-sur-pate artist under Marc Louis Solon and went on to work at a number of potteries. Her elder brother, Frederick Hurten Rhead, became a well-known pottery designer. At the beginning of the twentieth century the Rhead family was living in Fenton where Charlotte and her sister Dollie studied at Fenton School of Art. Charlotte started work at Wardle and Co, a pottery in Hanley where her brother Frederick was art director before emigrating to the USA in 1902. Charlotte did not stay at the firm long but it gave her the opportunity to develop her skills as a tubeliner, which would be useful to her in her future career as a designer. In 1905 Charlotte found employment as an enameller at Keeling & Co of Burslem. 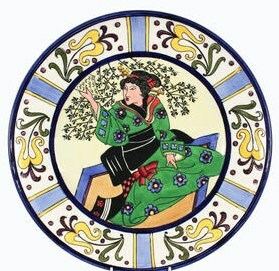 Pictured: A Burleigh Persian Plaque, by Charlotte Rhead, printed and painted marks – 35.7cm. Sold for £2,585 at Christies, London, May 2003. She was next employed as a designer at a tile-maker, T & R Boote. In 1912 Charlotte’s father was appointed art director of Wood and Sons, a firm which operated several potteries. Charlotte joined him there, taking charge of the tubeliners, and later working as a designer. Charlotte is perhaps best known for her association with Burgess and Leigh of Middleport (now known as the Burleigh Pottery), where she worked as a designer from 1926 until 1931. She began to train her own team of expert paintresses who would work on her designs. Many of the motifs she had used at Wood and Sons appeared in different forms on her work at Burgess and Leigh. Pictured: A rare Burgess & Leigh charger designed by Charlotte Rhead Tube-lined with a design of a Japanese lady wearing patterned green kimono, within a stylised floral border, 36cm, printed mark and tube-lined signature, pattern no. 4011. Sold for £1,620 at Bonhams, Knowle, November 2009. As well as producing many designs in large numbers, Charlotte also designed and produced a small number of highly decorated plaques (chargers). It is these designs that she created that are the most sought after and collected today. In the 1930s she moved to the firm of AG Richardson in Tunstall. Their brand name was Crown Ducal. She introduced the concept of tube-lining to their range and it is the Crown Ducal ranges are the most extensively found today. Charlotte Rhead Crown Ducal designs include Fruit Border, Tudor Rose, Persian Leaf & Aztec among others. 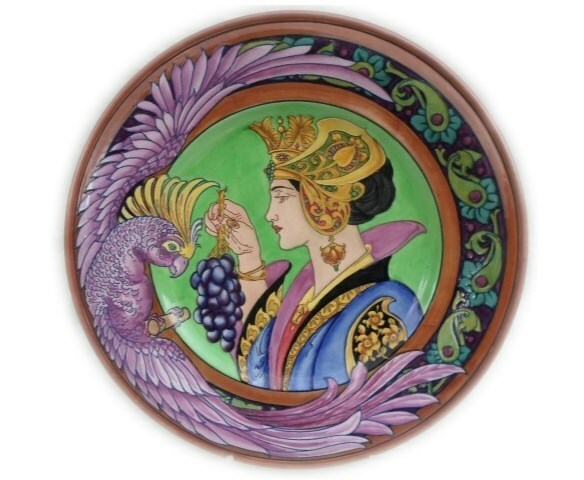 A rare Charlotte Rhead plaque charger lady with parrot. Sold for £3,600 at Charles Ross Auctioneers, September 2017. The Second World War affected the whole country and many companies had to change production due to to loss of staff. Charlotte moved to H J Wood in 1942 (H J Wood was a subsidiary of Wood and Son). At this time the Charlotte Rhead backstamp was created and the name Bursley Ware was re-introduced. 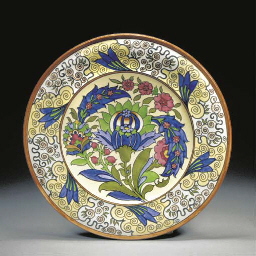 Charlotte Rhead continued to design but it is her earlier designs that she is most remembered. She died in 1947.